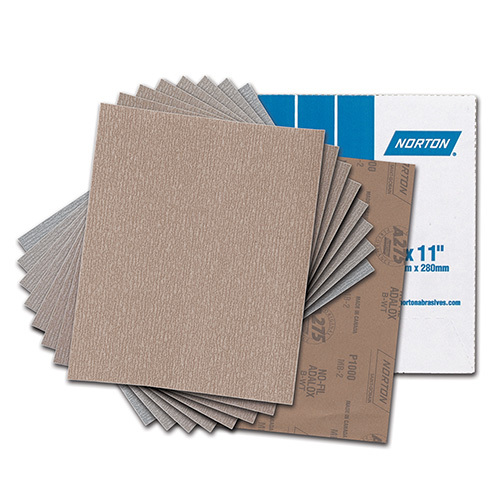 This load resistant paper is an excellent choice for aluminum polishing and other tool steels. The paper utilizes a No-Fil coating, which is a water-based stearate that provides maximum load resistance and extended life. Features a premium P-graded, heat-treated aluminum oxide abrasive yielding fast cut rates. Made with a fiber- reinforced latex-saturated backing, giving the paper exceptional flexibility and high tear strength. Available in grits 120, 220, 320, 400, 600, 800, 1000, 1200, 1500. Sold in 9” x 11” sheets.